It’s starting to happen. The thing I feared most when moving back to the Chicago area. The taking for granted of good pizza. For 8 years we lived in a vast desert of no pizza…otherwise known as Ohio. Every chance possible, we would get Chicago pizza. Every visit home required this of us. And now, after 4 months of being back home, pizza night brings “ughs” and “agains?!”. I think that means we have been eating too much deep dish. Yes? 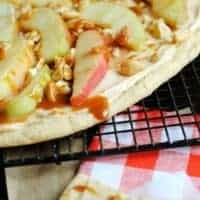 So we switched up Pizza Night with this delicious Caramel Apple Sugar Cookie Pizza. There were no complaints. And the only noise was moaning out of sheer joy! This was a great dessert. 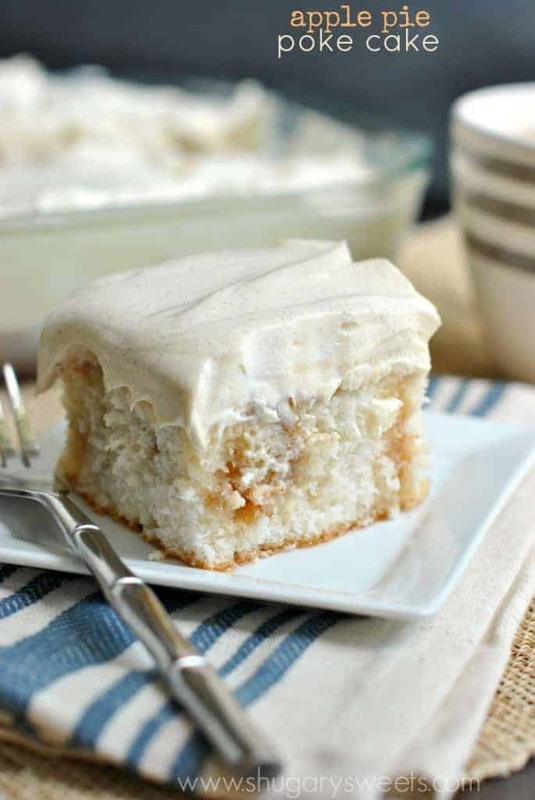 The chewy sugar cookie crust topped with a creamy Caramel cheesecake frosting. 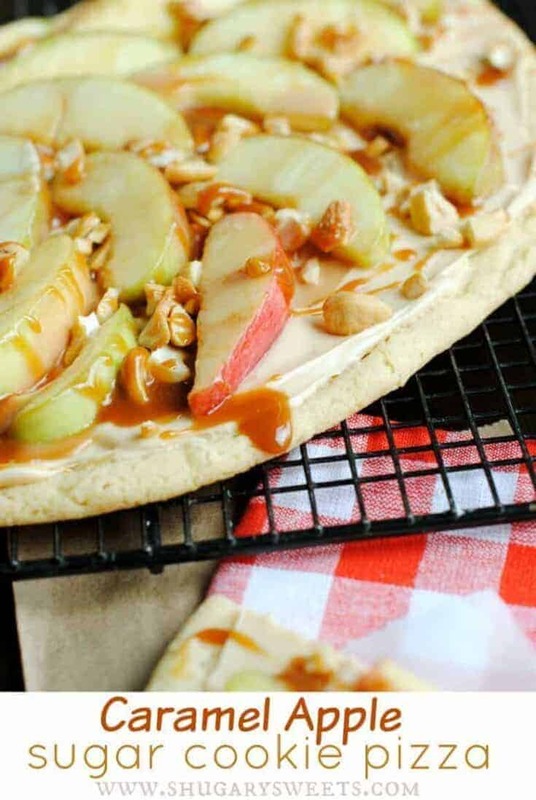 Don’t forget the sliced apples, caramel sauce and peanuts. You’ll think you just bit into a caramel apple! It’s no secret that I have been in cahoots with Crunch Pak apples for the past couple years. Have you tried their products yet? 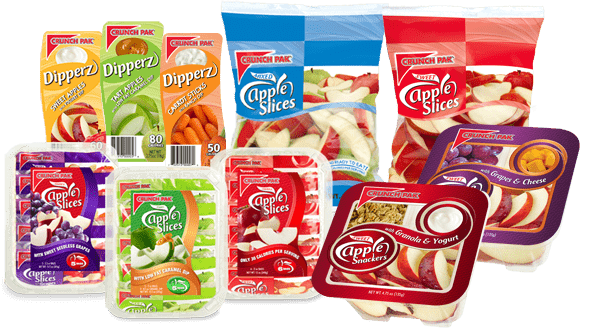 My kids love the snack bags of apples, and I love using the sliced apples for baking. It makes it so convenient to rip open a bag of apples and lay them on the pizza. And….they don’t brown up, perfect for making this before dinner and serving after your meal! Making a cookie pizza is so easy! You may remember this Macadamia Cookie Pizza I shared a couple years ago! It was the inspiration for today’s recipe. I use a refrigerated sugar cookie dough, but if you have a great homemade recipe feel free to use that too! My goal for this recipe was easy. Delicious. Convenient. I think it’s been achieved! What do you think? Line a 15inch round baking sheet (pizza stone) with parchment paper. Heat oven to 350 degree. Open package of sugar cookie dough and press it onto the parchment paper with the heel of your hand. Press evenly into a 12 inch circle. Bake for 15-18 minutes. Meanwhile, beat cream cheese with powdered sugar and 1/4 cup caramel sauce. Blend for about 3-5 minutes until light and fluffy. Spread cream cheese over cooled cookie pizza. Arrange sliced apples over cream cheese layer. Add chopped cashews and drizzle with remaining caramel sauce. Slice and enjoy! I use homemade caramel sauce https://www.shugarysweets.com/2013/04/chocolate-brownies-with-homemade-caramel-sauce-and-caramel-frosting. But you can also use caramel ice cream topping. 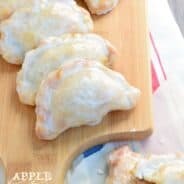 Here are some more great apple recipes! ENJOY! Apple Pie Poke Cake: delicious cake recipe that’s perfect for the holidays! 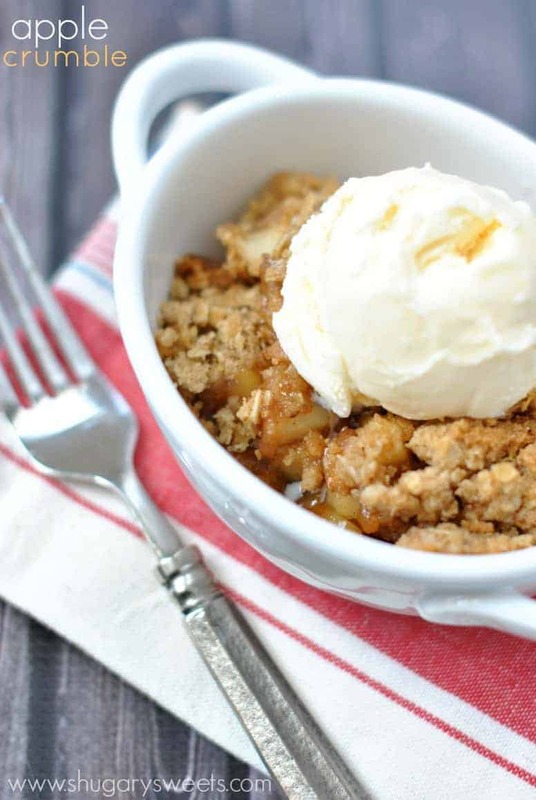 Apple Crumble: a classic dessert recipe. Follow Inside BruCrew Life’s board Apple Recipes on Pinterest. Break me off a slice of this! A cookie covered in sweetened cream cheese, caramel, and apples is pure dessert heaven. Love it! I love Lou’s. They are opening one across the street from me (OMG I’m in trouble, LOL)!! 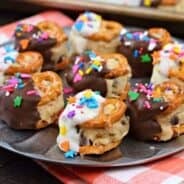 This cookie pizza would be so fun to make on the weekend with my kids! 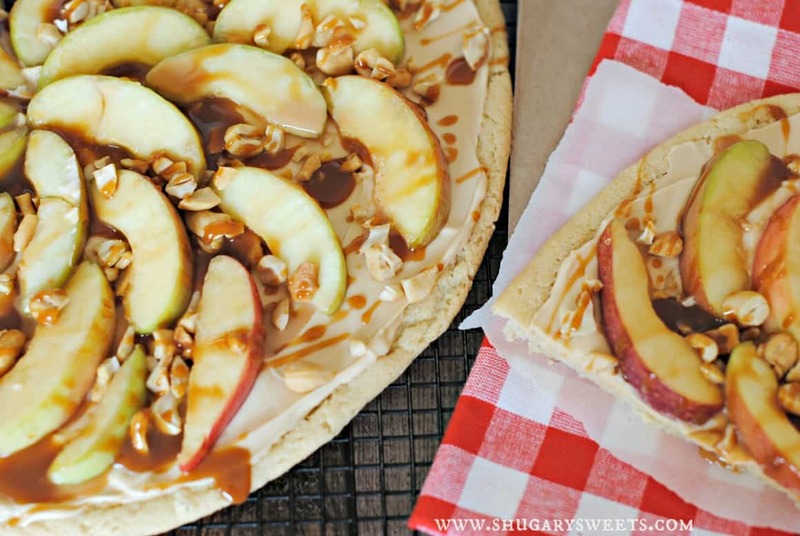 Love the apples and caramel! Pinned! Thanks for pinning Anna. With the ready made cookie dough, this one is a breeze to have the kids help bake! I almost made one of these in the summer with berries but just…didn’t. I even bought the sugar cookie dough! Then I ate it 🙂 Pinned, love it! what a fun dessert. the best of all as a pizza! This is the perfect quick and convenient dessert! I can never have too many of those in my stash. I don’t think anyone can ever have too much pizza! This dessert pizza looks amazing. 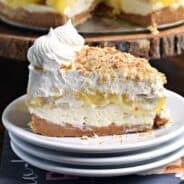 I really like the sugar cookie crust. Dessert pizzas are the best, especially when you make them yourself! OMG, you’re right. We DO share the same brain! Love this. Love caramel and apples. Love pizza. It’s just love everywhere! Too much pizza??? Never!!! Friday nights are almost always pizza night in our house…so far no complaining from anyone! I love this fun sweet pizza though! And of course Crunch Pak apples are the best 🙂 Cookie dough, caramel, and apple…match made in heaven! Yeah, maybe we need to change up our pizza nights. Try different pizzas. Restaurants, etc…. Ohhh! This looks so good! Can you tell me what keeps the Crunch Pak apples from “browning” ? They are not available in my area so I will use apples that I will peel and slice. Perfect way to switch up pizza night! 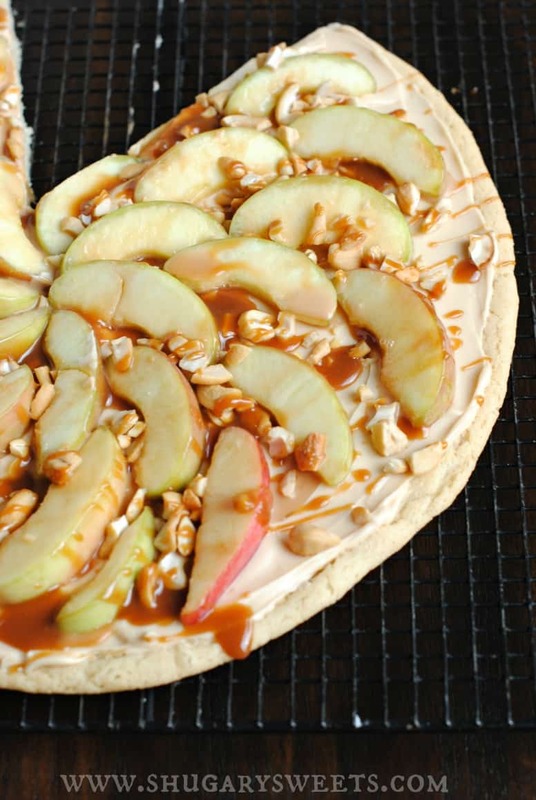 We can’t resist a good dessert pizza! This is my kind of Friday night pizza dinner! Apples and caramel for the win, always! Sugar cookie pizza is my favorite kind of pizza! Especially with that caramel cream cheese topping? Droooooling. My kids would really love this kind of pizza! Too much pizza? Is that a thing?!?! 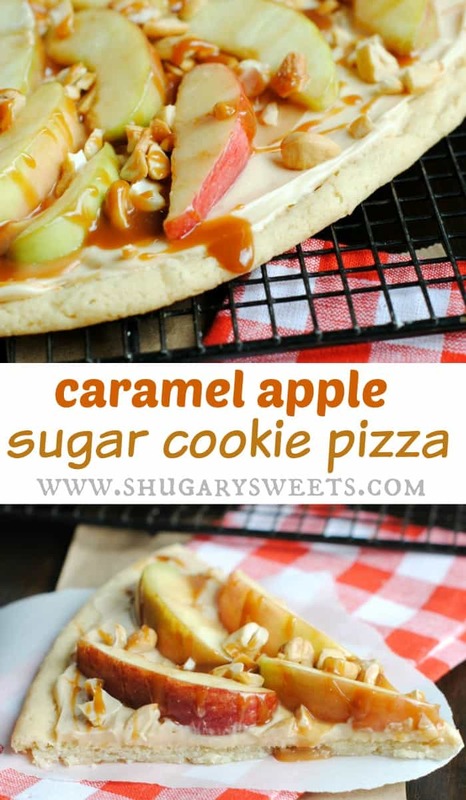 Well I wouldn’t mind the Caramel Apple Sugar Cookie Pizza making an appearance either! YUM! I want this for breakfast! Looks delicious. WOW! What an amazing pizza. I could gobble a piece right now! Go ahead! I won’t look!